Today, my signature hairstyle (aka one of four ways that I wear my hair) is being featured over at Bye Bye Beehive! This is the blog of a co-worker and friend who is going 365 days without styling or coloring her hair, and is raising money for our local cancer hospital in the process. Pretty impressive stuff! 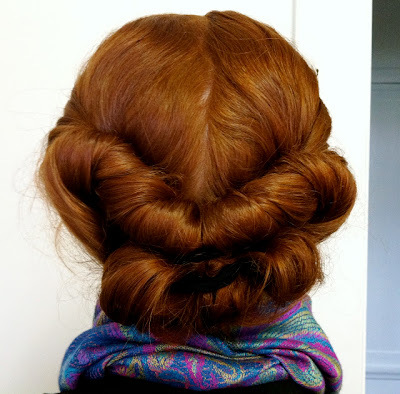 Miss BBB first blogged about the Zoë Twist here, and now it's my turn to show how it's done. I hope you check it out and enjoy! Yeahhh Boiiii! Zoë you're a star! WOW. you have amazingly gorgeous red hair. cheers from a fellow redhead.